Seeing them around Yellowstone requires a great deal of serendipitous luck but a place that is easiest to find the in Trout Lake in Northeast Yellowstone in July. The otters there are pretty habituated to humans and are less spooky than any others I have ever seen. Adult river otters can weigh between 12 and 30 pounds. 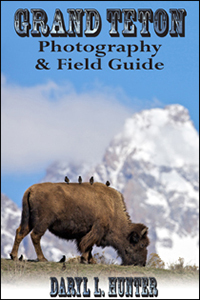 They are protected and insulated by a thick, water-repellent coat of fur. A member of the weasel family, they are equally versatile in the water and on land. 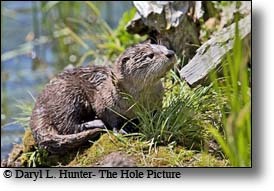 Otters establish a burrow close to the water's edge along a rivers edge lake. Dens have openings above water in summer, but in winter these are closed and the only entrance is below water. The entrance opens up to a large nest chamber, which may have a bare floor or a slight accumulation of leaves or grass. They are a shy critter, unobtrusive creatures that are seldom seen even though they are active throughout the year. 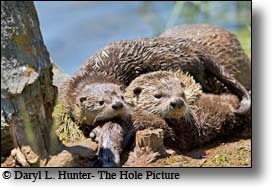 Female otters give birth in these underground burrows, producing litters of one to six young. 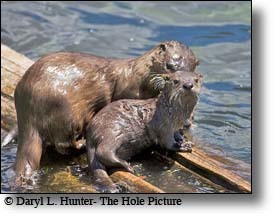 Males do not help raise young otters. Females retreat to their underground dens to deliver litters of one to six young. When the young are only about two months old, they get an advanced swimming lesson when their mother pushes them into the water. Otters are natural swimmers and, with parental supervision, they soon get the hang of it. Otters are expert swimmers and divers, swimming at an average speed of seven miles per hour and staying underwater for up to 2 minutes. With eyes adapted for underwater vision, otter's are nearsighted above water. Sound, touch, and smell are very important senses that otter's use to communicate with each other. Their vocalizations include a whistle, probably used to communicate over distances, and a shrill, chattering call, emitted during the mating season. They chuckle softly to siblings or mates, apparently as a sign of affection, and also chirp, grunt, snort, and growl. Unlike muskrats or beavers, otters barely make a ripple when swimming or splash when diving. 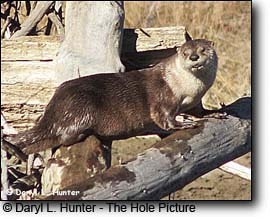 Their specially built ears and nose have a valve-like skin that closes and keeps the otter watertight underwater. River otters are often found in family groups. A family unit is made up of a female and her pups, with or without an adult male. 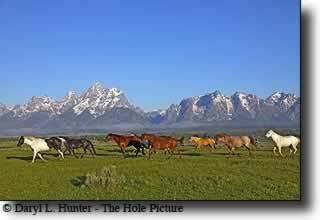 The family usually travels over an area of only a few square miles. The female appears to dominate the rest and may drive other animals away from a small area around the den where her pups are living. Other groups may consist of an adult male and female, a litter of pups that remain together after the family separates, or a group of bachelor males. Male groups usually consist of fewer than 10 individuals. Larger numbers that are occasionally seen together may represent a temporary association of neighboring groups. The groups have no apparent leader. Otters travel together and operate as a social unit but do not cooperate in hunting or share what is caught. Even though otters travel over a wide area, apparently there aren’t any exclusive territories. Fighting among otters is extremely rare, although they are wary of strange individuals. 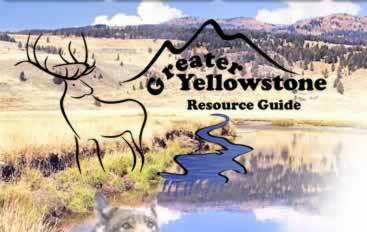 Their range has been significantly reduced by habitat loss. 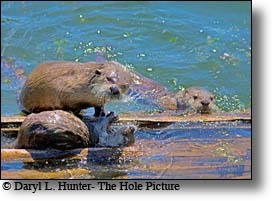 However, in some regions their population is controlled to allow the trapping and harvesting of otters for their pelts. Otters have few natural enemies, especially in water. On land, young otters are vulnerable to a variety of predators such as the fox, wolf and raptors.